ICO: Private token sale ongoing. Starts March 20th, 2018. Token: XYO, an ERC-20 token. A finite number of tokens will be issued with a tiered pricing structure that starts at 1 ETH / 100’000 XYO. In a nutshell: A trustless, distributed network for location data (oracles) integrated to the Ethereum Blockchain smart-contracts. There is a word for the jerks stealing delivered packages from our doorsteps: it’s “Porch Pirates.” I have always found the use of the word “pirate” to be perfectly suitable. Not only for the deviant behavior, but also because Jack Sparrow sails ships the same way “Porch Pirates” drive change. It’s somehow the Social Functionalism theorized by many great minds of modern sociology – the likes of Emile Durkheim. While this article is not about sociology, “Porch Pirates” rushed tech savvies and inventors to their labs and initiated a new sub-industry that feeds on location data: the “findables“. One of the tech startups that gained a lot of respect in this space is San Diego based XY Findables. Chances are, you have already come in contact with one of their flagship products XY Find It. Taking off as a Kickstarter project, their stylish, techie gadgets looking fresh out of sci-fi were a commercial success. A few years down the road, it’s the Blockchain era that catalyzes innovation like we’ve never seen before. For the Findables space, XY is leading the path once again with an innovation of its own: the first location-based decentralized oracle on the Ethereum Blockchain. Let’s get a closer look. The great introductory video featured on the XYO Website sends a message, loud and clear: XYO means business. It’s not the average ICO your roommate has been harassing you about, nor is it a side Blockchain project looking for an easy way around VC funding. These are knowledgeable, professional and accomplished individuals with a well-penetrated product in the market. There is a clear vision, a stable business model, and a scalable strategy. More importantly, XYO leverages innovative in-house know-how and crosses – with ease and finesse – the bridge between ideation and prototyping. From a technology perspective, here is what we need to know. The need for a difficult-to-disrupt system to complement GPS has been well known for years. GPS is exceptionally accurate and dependable, yet jamming, spoofing, cyber attacks and other forms of interference appear to be growing in frequency and severity. This has the potential for devastating effects on our lives and economic activity. This is where XYO comes into play. By applying Zero-knowledge proof to the location data, XYO builds a trustless, decentralized network of high-certainty data that is spoof-resistant all on its own. Here is how the system works by design: Sentinels are the ones that collect location data then produce “temporary ledgers” with an accurate stamp of the data location. 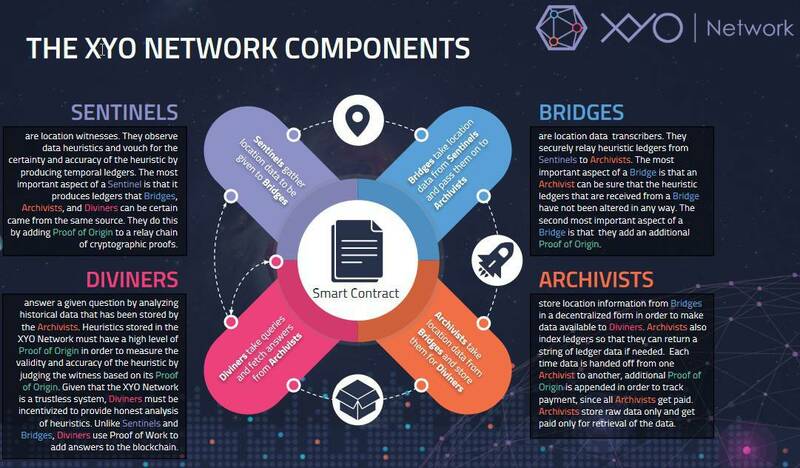 Then, it’s up to Bridges to relay this data from sentinels to Archivists while providing immutable Proof of Origin – the XYO proprietary consensus mechanism. Archivists then store the relayed information into distributed ledgers for Diviners to analyze. Finally, Diviners are the Oracles that generate answers to “queries” (the term used for any token holder inquiry, such as “where is my package”) and lock the process into smart contracts. The XYO Network has many use cases with an unprecedented potential to disrupt the location data industry. The most obvious one being e-commerce, where the Network can provide immutable proof that a package has been delivered into the customer’s home while tracking the package along the way. Combining this with the Ethereum smart contracts, the Network can automatically initiate payment when a package is delivered, saving both time and energy. It’s zero-knowledge proof at its best! Other use cases encompass airline baggage tracking, cargo inventory, diamonds tracking, car rental tracking, and online review authenticity verification. The token sale event is live as of press time (from March 20th, 2018) and embodies a tiered pricing structure with an initial token price of 100’000 XYO tokens per 1 ETH. Only ETH will be accepted as a payment method, and the team has invested a great effort in KYC and safety making it virtually impossible for hackers to slip through the safety net. Prospective users are prompted to carefully follow the instructions on the website and only send ETH to the token address listed. That’s right; the team puts forth many documents for the prospective users with different levels of technical detailing. The white paper is technical-oriented and makes for a 20-pages-read of exceptional quality. For marketing purposes, an overview document is also presented with an executive summary. To focus on the token economics, the green paper dives deeper into the state and shortcomings of blockchain technologies today. It also provides insight on how XYO Network delivers viable and consistent answers to the location data space. 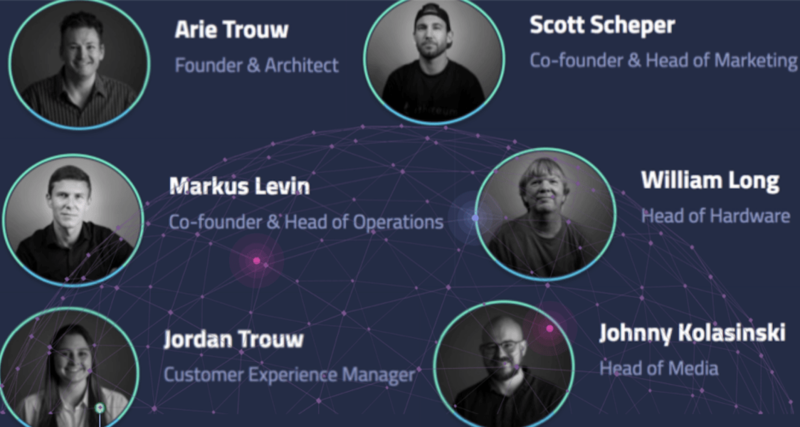 One of the strengths of the XYO Project is its team; versatile with seniority and expertise. You’ll find seniors like CEO Arie Trouw founder of XY Findables in 2012. There are also high-school grads like the naturally gifted Tobyn Jacobs bringing his hackers savvy to strengthen the stability of the product against spoofing. The rest of the team is mainly engineers, business developers, and marketing experts. A key member is Scott Schepper, an excellent marketer and a keen professional in the startups’ ecosystem. Another key member is co-founder Markus Levin, bringing his 15 years of entrepreneurial experience to the promising project. There is also William Long, the brain behind the great “findables” products of the XY company. It all started in 2012 with the creation of XY Tech startup following a successful Kickstarter crowdfunding event. 2016 is when the third-gen product “XY3” established itself in the location data gadgets business. The startup was sec qualified with an A+ Securities rating. In 2017, XY Releases GPS Tracking Device: The “XYGPS,” The XY4+ Device, crosses the 1’000’000 products sold milestone. It’s also when XY Oracle network kick-started. to launch the first “XYO Token” to be used for smart-contracts to Access the XY Oracle Network. XY will complete the development of the XYO Testnet. Release of the XYO Network API that enables smart contract developers to write contracts to interact with the XYO Network. Launch the sticker-based tracking product, the “XY-Stick” to enable retailers and e-commerce businesses to track their products in real-time. This will potentially mark the end of “Porch Pirates”! DISCLAIMER: Investing or trading in digital assets, such as those featured here, is extremely speculative and carries substantial risk. This analysis should not be considered investment advice, use it for informational purposes only. Historical performance of the assets discussed is not indicative of future performance. Statements, analysis, and information on blokt and associated or linked sites do not necessarily match the opinion of blokt. This analysis should not be interpreted as advice to invest, buy, sell or hold and should not be taken as an endorsement or recommendation of a particular asset. Blokt may receive financial compensation in exchange for publishing this article. Next articleBitnation – Is Blockchain Technology Moving Us Towards a Post-Nation-State World?